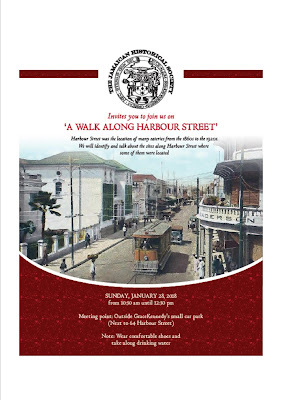 "The Birthing of Jamaican Cuisine" could have been the title of the trip "A Walk Along Harbour Street" that the Jamaican Historical Society hosted on January 28, 2018 along Harbour Street, Kingston. Charmaine McKenzie gives the group an orientation. At far right is a member of the Parade Garden's Benevolent Society. 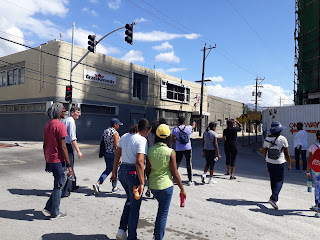 The tour was led by food historian and past president of the Jamaica Historical Society, Charmaine McKenzie, accompanied by Professor James Robertson of the UWI, Mona History and Archaeology department. 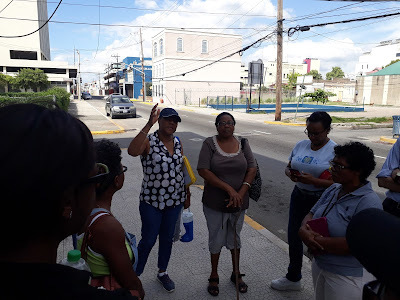 Archaeologist at the Jamaica National Heritage Trust (JNHT), Audene Brooks, was also on the walk. As we went along, residents of Parade Gardens Community Benevolent Society joined the walk, attired in their society's logo shirt; their participation added to the general knowledge learned about the area. 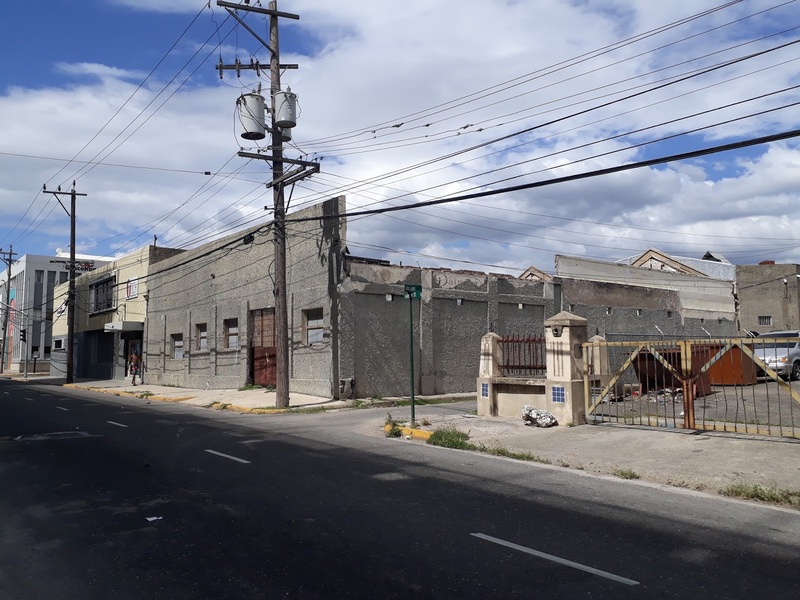 The community is a recipient of development projects through the Planning Institute of Jamaica's Community Renewal Programme (CRP). 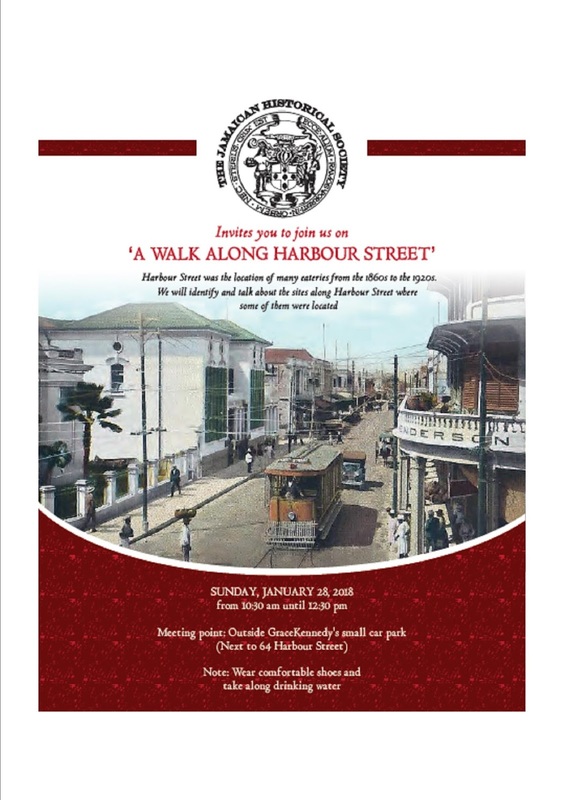 Ms McKenzie set the tone by allowing us to paint a mental picture of Harbour Street in the late 1860s. 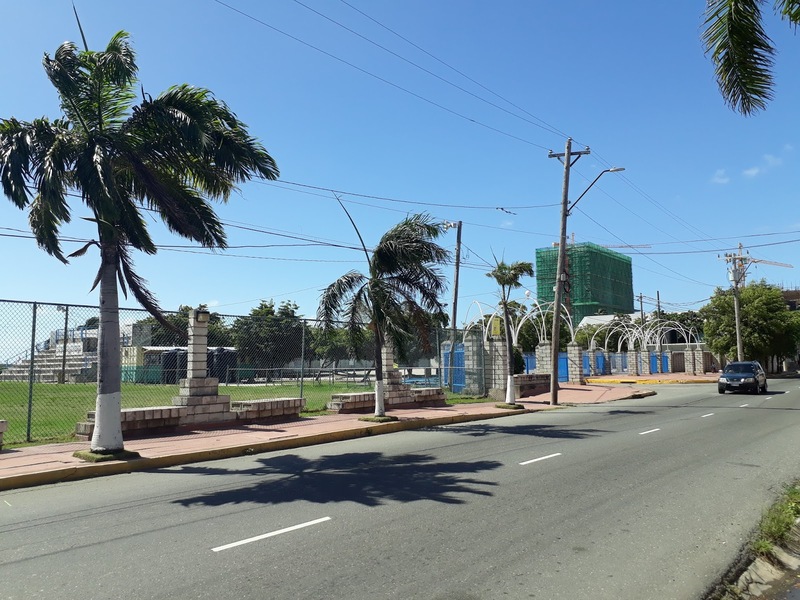 Under her direction, the smooth concrete wall of Ocean Boulevard melted away and brought 1.5 Km of shoreline right up to Harbour Street, from where hundreds of narrow wooden finger piers jutted into the water, along the length of the street. This era was a dramatic time of change for mariners as the age of sail was giving way to the age of steam. Kingston was a major seaboard for Western Atlantic trade and vessels from as far as Belize participated in harbour as a transhipment port. 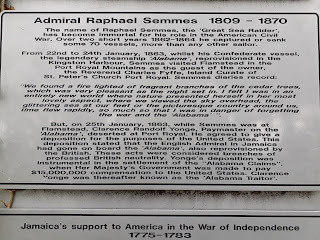 The following point was not included on the tour, but in 1863, during the USA Civil War, a confederate ship was provisioned in Kingston Harbour, which led to the UK paying a fine for breaching the treaty that had ended the American War of Independence. This story is told on a plaque at Flamstead, St Andrew. UK Navy of USA relations over provisions (food and water). McKenzie highlighted that seamen wanted...needed...refreshment, and food at ports of call. Despite this demand, eateries on Harbour Street opened, closed and changed hands frequently. It seemed to have been difficult to be profitable in this business. There were two main kinds of eateries at that time. The public table and the dining room. In both examples there was a table d'hote, a daily menu that was prepared for patrons. The European innovation of our modern restaurant had not yet arrived in Kingston. The public table was a cookshop where anyone could order and eat their meals at a long table with benches. The dining rooms were in private clubs for members and certain visitors. Sometimes the dining rooms were attached to a guest house or to a hotel. Some eateries with public tables also made it known that they catered to travelling ladies, which would suggest that the environment was not crude and did not invite a certain kind of patronage. The menus of both were plain European style food, such as cuts of stewed meat and products made from wheat, but by the 1870s the records show that the item rich creole soups and stews was being celebrated and served in some establishments. Also, more local bakers had developed proficiency in the skill and were offering new products. Naturally, having an abundance of sugar cane products and locally grown spices the creole dishes gradually gained notice. These Jamaican creole dishes were a blend of imported food and food that was grown in Jamaica using European stovetop and oven cooking techniques. This was before the infusion of Middle Eastern and Asian food influences. Ms McKenzie has viewed the manifests of ships that came into Kingston Harbour and noted that there a large volume of consumer goods constantly came into Kingston, much of it remained in Jamaica. Among the goods was a lot of food stuff, and a lot of ale, wine and spirits, and these would have been offered at the eateries on and around Harbour Street. Important to the eateries was the preservation of food such as meat and vegetables. During this period, businesses that had cold rooms had ongoing arrangements with cookshops to store food overnight. These included meat, butter, milk and vegetables. This would have been before the age of electrical refrigeration, when packed ice was brought in from polar regions. Electrical refrigeration services were in demand on Harbour street up to the mid 20th century as on our walk, we observed three buildings that housed refrigeration businesses and also the Gold Street power station, all of which operated on Harbour Street up to a few decades ago. 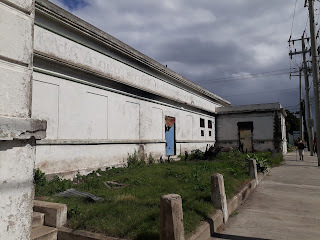 During this period, the eateries were owned by Europeans and some Middle-Easterners, but the cooks were Jamaicans, and increasingly, so were the patrons, many of whom were originally from rural areas. McKenzie's walk pointed out the location of some public tables. Mrs McDougall ran respectable rooms and a public table where the Air Jamaica building now stands (72 Harbour Street). McDougall made the newspapers when she pulled her gun and successfully tackled spies who tried to destroy documents belonging to one of her house guests, a Haitian military general! At another point on the walk, near Spectrum Management Authority (13-19 Harbour Street), another owner is recorded to have tried several kinds of food related businesses, but he seems to have failed and moved further away from the harbourside, where presumably, rent was cheaper. property where there was a dining room for members only. The public tables were dynamic places, as anyone could sit there, and there were frequent culture clashes and the rowdiness of which seamen are famous. There is a newspaper account of a court case where a seaman had delivered racial slurs to a Black Jamaican. 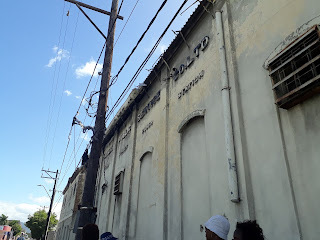 The ending of that story was not told on the walk, but the courtroom, which was also on Harbour Street at the time, was packed on the day that the matter was heard. 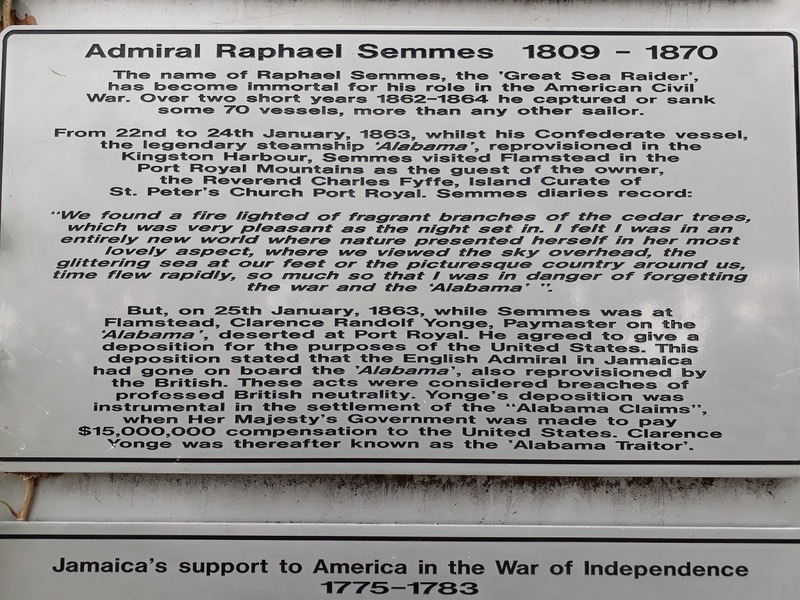 Jamaicans were exerting their rights as free men . When the tour passed High Holborn Street, the group observed that tram rail lines that still rise above worn asphalt. Across the road two towers rise. 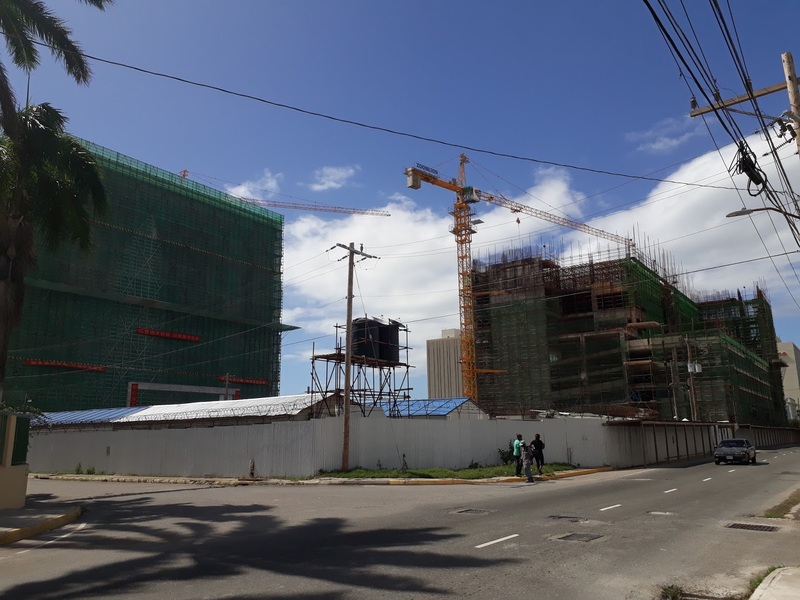 One will be a new government building and the other the headquarters for GraceKennedy, which incidentally is the parent company for a popular household food brand. The residents of Parade Gardens, who were born in the mid 1960s, and also archaeologist Brooks, spoke about the fresh water well that is within the boundaries of what was the Myrtle Bank Hotel. That property will shortly be the Ministry of Foreign Affairs and Foreign Trade. The group hopes that the new development will preserve and celebrate this fresh water well that had continually served seamen from the Taino era until the early 1900s. 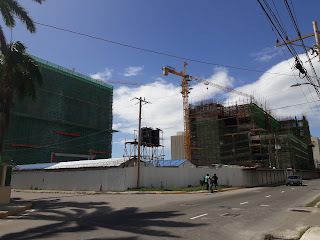 The new home of GraceKennedy now under construction. The era that was discussed by Ms McKenzie ended just before the Kingston earthquake of 1907, and which caused so much destruction that it changed the built environment of Kingston forever. The buildings may have gone, but the business of the harbour continues, and with that, refreshment for seamen.